Young hero Allu Sirish, who made his debut with ‘Gouravam’ could only impress the critics with his performance, but the film bombed at the box office. This time around, he has teamed up with Maruthi for a commercial hit in Kotta Janta. 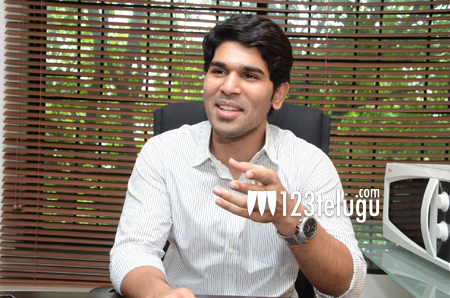 We caught up with Sirish for a detailed interview, and let’s see what he has to say. Q) Tell us something about your role in this film? A) In this film, I am playing the role of a young selfish TV Anchor. What happens if a selfish guy falls in love? How far will his love be genuine? That’s forms the story and my character in the film. Q) How was it working with Maruthi? A) Even before I became a hero and Maruthi became a director, we know each other. The whole team who worked for this movie are all known faces and we thoroughly enjoyed working together. Q) Whose idea it was to remix Chiranjeevi’s song? And also tell us something about Madhurima? A) It was director’s idea. When we decided to keep an item song, then we thought why can’t we remix a famous song rather than going for a new one. Coming to Madhurima, we didn’t take her just for an item song. She plays a important role in this movie. During the end of this item song, the story takes a crucial turn. Q) Your debut film ‘Gouravam’ didn’t do well? Do you regret doing that movie? A) Even though the story was powerful, ‘Gouravam’ lacked commercial elements. But, in ‘Kothajanta’ we took care that the story has commercial elements. Q) For the first time, you tried comedy in this film. Did you feel any difficulty in doing comedy? A) It’s not that difficult to do comedy. if a person is humorous it will automatically reflect on screen. In this movie, the character’s mannerisms and acts will make people laugh. Q) How far did Allu Aravind get involved in this film? We have heard that few scenes were re-shot? A) There is no involvement of my dad in this film. Once we finished our story sittings, my dad got involved only during editing. We only shot few scenes which didn’t come out as we expected. And after watching the whole movie, we felt that Sampoornesh Babu’s track is unnecessary and has no connection with the story, the whole team decided to remove it. Q) People say that you are arrogant. What do you have to say about this? A) I don’t know how that news came out. People close to me know what I am in real life. Q) Previously, you said that you will take the production responsibilities from your dad, but suddenly you turned into acting. Any particular reasons? A) Yes, may be in the next 5 to 6 years, I will take the production responsibilities. The main reason behind this is that, to handle the production responsibilities you need to be experienced. I am very young and I lack that experience. Q) Did Bunny watch this movie? How is his new born son? A) Bunny, as a viewer enjoyed the movie and he even gave me his feedback. He said that this would be a good film in this summer. Allu Arjun’s son is good, everyone are saying that he is like his mother. Q) As a hero, what kind of films you would like to do in future? A) As usual like any actor, I would like to do good films in future. But I would like to do more films which have a strong story and can attract the youth. I am planning in such a way that my next 5 films will be youthful entertainers.